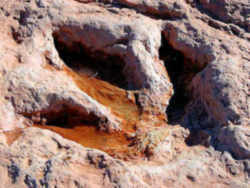 Dinosaur Tracks, (Eubrontes Giganteus,) was adopted in 1991 as the state fossil. The Connecticut Valley is the world's foremost dinosaur track locality. Many different types of fossil track impressions have been found in the Valley's sandstone of the early Jurassic period (200 million years ago). Eubrontes, a large three toed track, was designated the State Fossil in 1991. Although no skeletal remains of the specific track making dinosaur have been found, the shape, size, and stride of the Eubrontes indicate that the animal was closely related to the Western genus Dilophosarus. Two thousand Eubrontes tracks were discovered on a single layer of rock in Rocky Hill in 1966 and subsequently Dinosaur State Park was created for their preservation and interpretation. This Registered Natural Landmark site receives visitors from throughout the world. Eubrontes (Hitchcock, 1845) is the name of fossilised dinosaur footprints dating from the Late Triassic and Early Jurassic. They have been identified from France, Poland, Slovakia, Italy, Spain, Sweden, Australia (Queensland) and the USA. It is a junior synonym of Grallator. Eubrontes is the name of the footprints, identified by their shape, and not of the genus or genera that made them, which is as yet unknown. They are most famous for their discovery in the Connecticut River Valley of Massachusetts in the early 19th century. 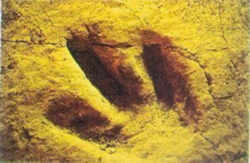 They, among other footprints, were the first known dinosaur remains to be discovered in North America, though they were initially thought to have been made by large birds by Edward Hitchcock, a professor of Amherst College. Another major find occurred at Rocky Hill, Connecticut in 1966. Nearly 600 prints are preserved there in an area now designated Dinosaur State Park. In early 1970s, a fiberglass cast of an Eubrontes giganteus footprint was made by Paul E. Olsen, then 14 years old, and his friend Tony Lessa. On June 29, 1972, it was sent by Olsen and Lessa to President Richard Nixon to get his support for registering the Riker Hill Fossil Site in Roseland, New Jersey as a National Natural Landmark. The Journal of Avocational Paleontology, November 2000. NOTE: All text below is taken directly from the magazine Fossil News: The Journal of Avocational Paleontology, November 2000. Today New England is a charming and picturesque land, covered by beautiful rolling hills and dense pine and birch forests. But, 200 million years ago, during the dawn of the Jurassic, this corner of the American northeast was covered by a much different landscape. At this time the Atlantic Ocean was just beginning to form, and to make room for this new body of water, present day North America and Europe split into two landmasses. Along the line of this break formed a giant rift valley, which was gradually filled with sediment carried by rivers and streams. This gradual deposition left over 16,000 feet of sediment in the valley, and also left large, open mudflats, which were the home to countless species of dinosaurs and other reptiles. Sheets of mica covered these flats, preventing mud from sticking to the feet of these dinosaurs as they walked. The result: thousands of exceptionally well-preserved footprints! Today these footprint layers, which make up the East Berlin and Portland Formations, are exposed and often quarried in Connecticut. Several species of fossil footprints fill these strata, including those of the bird-like Grallator and the crocodile-like Otozoum. But, the most common print is likely that of Eubrontes, a track which likely belonged to a mid-sized, bipedal predatory dinosaur. A typical Eubrontes print ranges from 40-50 centimeters (16-20 inches), and contains three long toes, often with evidence of a heel. Based on the large size of these tracks, the Eubrontes trackmaker must have been over one meter high at the hips and 5-6 meters long. One possible culprit is Dilophosaurus, the familiar crested dinosaur from Jurassic Park. The size of Dilophosaurus is basically consistent with these measurements, but nothing short of finding a fossilized Dilophosaurus track in a Eubrontes print will conclusively pinpoint this Jurassic theropod. The first Eubrontes print was discovered and named in 1845 by the famous paleontologist Edward Hitchcock. Throughout the next century several more Eubrontes prints were discovered throughout Connecticut and Massachusetts-including some evidence of possible Eubrontes social order, until the mother lode of all dinosaur prints were discovered in Rocky Hill, Connecticut in 1966. While digging the foundation for a new State Highway Department testing laboratory, workmen made a remarkable discovery. About four feet beneath the surface they discovered hundreds of three-toed dinosaur tracks. Paleontologists, including John Ostrom, were called to the scene, where they recommended that the site be protected. Several local newspapers backed their plan, and a mere three weeks later Governor John Dempsey designated the site a state park. 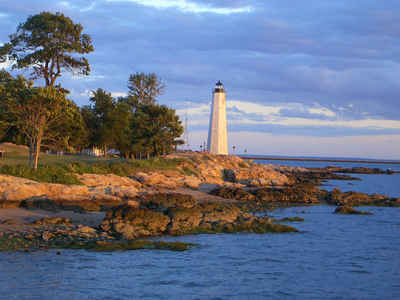 Today this area is known as Dinosaur State Park, and is one of the most popular tourist destinations in New England. Nearly 600 tracks are exhibited in their natural state under the park's large geodesic dome, providing paleontological thrills for those traveling through the rolling, historical state of Connecticut. The law designating thedinosaur footprints of Eubrontes as the official Connecticut state fossil is Section 3-109 (State bird) of the Connecticut General Statutes Title 3 (STATE ELECTIVE OFFICERS) Chapter 33 (SECRETARY) Section 3-110g. Sec. 3-110g. State fossil. 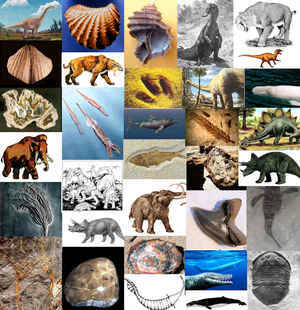 The dinosaur footprints of Eubrontes shall be the state fossil. Ichnites, usually just called dinosaur tracks, are the fossilized footprints of dinosaurs. Dinosaur tracks provide important scientific information about the behavior, foot structure, posture, gait, chronology, environment, and geographic distribution of dinosaurs. However, for many years, most paleontologists seemed to place little importance on dinosaur tracks, viewing them mainly as curiosities. This attitude has changed in recent years, and ichnology, the study of evidence left by an animal while it was alive, was revived in the 1980s. Eubrontes is the state fossil of Connecticut. The type species is Eubrontes giganteus. The French footprint has been called Eubrontes veillonensis. The name means 'true thunder,' probably referring to the supposed weight of the animal impacting on the ground. The word ichnite comes from the Greek word ίχνος (ichnos), meaning a track or footstep. A trackway attributed to the ichnogenus Eubrontes had a missing second digit on the right foot. The animal could have either lost the toe due to injury or it was malformed.